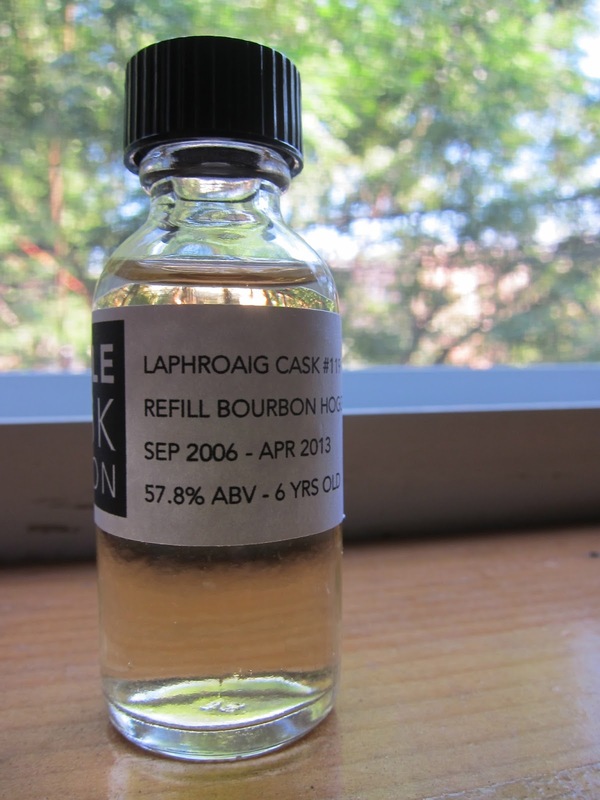 Single Cask Nation Laphroaig 6yo (57.8%): And the second sample from Single Cask Nation. It is distilled in November 2006 and aged in a refill bourbon hogshead. The cask which was numbered as #119 was bottled in April 2013 and yielded 269 bottles in total. Color: Very pale, dry hay. Nose: Doesn't show it's young age or high abv., pretty mellow (for now). Nice refreshing cold ocean breeze at your face on an early morning at the beach. You throw the stick, the dog brings it back, etc... And if you also happen to be the guy/gal who will prepare the barbecue at the very same beach later that afternoon probably your hands and your sweater would smell more or less like this: struck matches, charcoal, diesel fuel and soot from the newspaper pages you used to start the fire. On top of these maybe also the rubber band ball the dog was playing earlier with and candied bergamot peel. Adding a few drops of water starts a whirlwind! The alcohol explodes and finds its way through your nostrils and then to your brain. Didn't see that coming to be honest... After it calms down bitter green aromas appear: mizuna greens and dandelion leaves. Now it noses like the kitchen of a vegan restaurant. Palate: Almost like licking the ashtray on your bedside table you didn't empty for a week. Banana peppers and green asparagus you put and forgot on the grill for your vegetarian friends half an hour ago. Very grassy with purslane and watercress leaves. Water addition pushed it even to a greener and bitter side. Now we have something very beautiful and unique here: Mustard greens, rocket leaves and stinging nettle tea with a gentle sprinkle of sea salt. Finish: Endless. Sea salt, inner tube river ride and tincture of iodine. Overall: Score! I love underaged Islay whiskies but this cask is really good! Actually pretty close to their four year old Kilchoman they released before but way more grassy. It is kind of amazing that I expected their Kilchoman would be grassy but it happened to be very coastal at the end. And here I thought that this bottle would be coastal but showed amazingly nice green and grassy qualities. I loved that mustard green note, made my day today... Let's see what the Glen Moray will taste like.